Yo, ho, ho, and a bottle of rum. There was a time when I was a young lad that I was overweight. Aye! I was in high school and I was fond of eating a lot of foods. Har, har, har! When I went to college, me saw lots of pretty girls but me didn’t have the confidence to approach them because of me appearance. This bucko then decided to lose weight and that’s when I learned about calorie counting. Me made healthy food choices and counted the calories me took. I had to read a book to find the calories of each food me took as there was no Internet back then. But now, there are apps that make it convenient like the one that I will share with ye. It’s called Calories in Food by Alexey Korobov. This app is very basic. 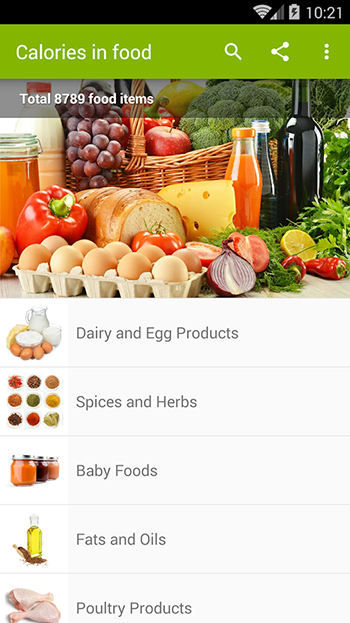 When you open it, the main page will show you the list of food categories that include dairy, poultry, spices, etc. There’s also a picture of different foods on top that has a vibrant color. There are advertisements at the bottom of the page, although there is an option to hide them for free. However, when you close the app and open it again, the ads will appear again, so you have to hide them again. Moreover, this option is not visible right away as you have to tap on the dots (menu) on the upper right to see it. There are over 8 thousand food items and it includes the main food groups so there’s a big chance that you can find the foods that you are looking for. There are also restaurant foods but they are only limited. If you are the type of person who eats a lot outside, you may not find much of the information that you need. As mentioned, the foods are listed by categories. Some of them are dairy and egg products, spices and herbs, fats and oils, poultry products, etc. Each of the food categories has a picture on the left side. When you click on a category, the food items will be listed with their name and amount of proteins, fat, carb, and calories. They can be sorted by name and calories. There’s also a search option where you can type the name of the food you are looking for. Calories in Food is free to download and it has an option to remove the advertisement for free. It has a basic interface and it has thousands of foods on the list. There’s a search option to make it easier to find the food you are looking for. Foods are organized in categories and can be sorted by name or calories. Even after choosing the option to hide the advertisements, they will still appear the next time you open the app. There are also not much foods listed under the restaurants category. 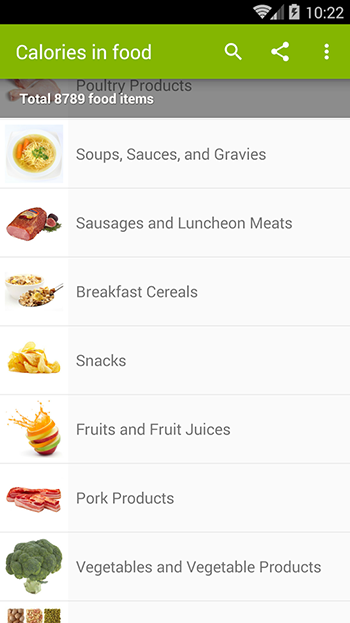 If you wish to check on the calories of basic foods, then this is a decent app to choose. It’s nothing fancy on the way it looks but it serves its purpose. It however doesn’t have much foods listed under restaurants so if you are looking for more of these, there are other apps that you can find.